Hi loves! Today, you get some outfit inspiration (I was a little serious when we shot this, ha!) and some personal tips from me on building self-confidence. Before I start, I want to digress and say that when I was growing up, I was painfully shy. Here’s how bad it was: if you had given me a choice, I would’ve chosen to do math homework over talking to people. And if you know me, I hated numbers. I got worse at math as soon as I got to freshman year of high school (I remember thinking, “Since when did math have letters in it? !” LOL) and hated it even more. Today? I’m sad to report that I still have not improved in this area of math so I still hate numbers, ha! Anyway, I started getting over my shyness a little bit at a time through experiencing some things during my high school and early college years. It was probably one of the most confident times of my life. 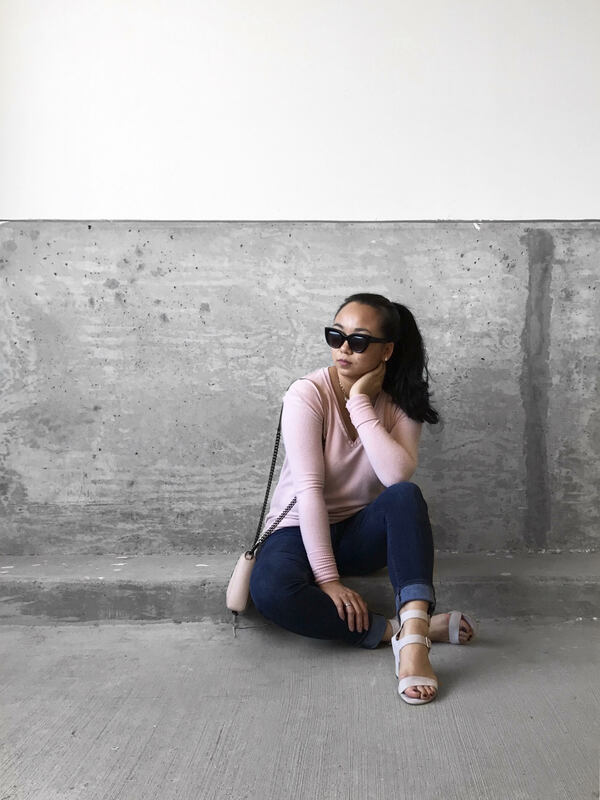 Then my confidence and view of self-worth took a nose dive towards the end of my college years through other experiences and since then, I’ve been working hard to gain it back. That leads me to today’s topic about self-confidence. Everyone struggles with self-confidence. Some people hide it better than others. I feel that some people search for ways to build their confidence up, but they’re really not sure how to do it or where to start. 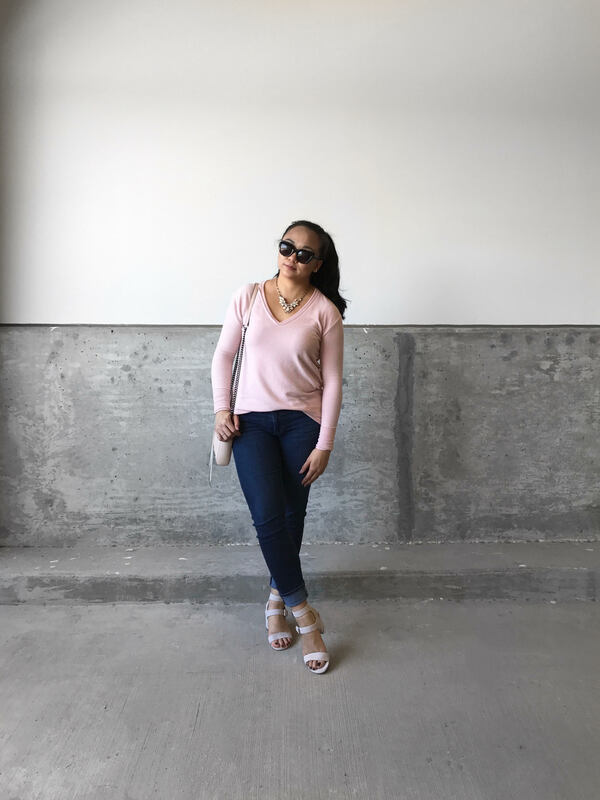 So today, I wanted to share five of my personal tips about building self-confidence. Ready? Okay, if you’re shy, you may not be AS ready, but still! After seeing me interact with people at an event a few years ago, one of my besties asked me how I knew so many people. I told her my secret: if I know I’ll be meeting these people someday, I start building a relationship ahead of time. I love building relationships with people online first for a long time before meeting them in person. It makes the initial meet up way less awkward for me. Call me selfish, but it works! I have been able to walk up to someone I’ve never met in real life before with the utmost confidence because of the interaction I’ve had with them online beforehand. They may not know this, but I’ve done this with my photographer friend, Megan (whom I knew from Instagram/Facebook), founder of DFA, Mai Lyn (met her on Instagram) and a lot of my USANA friends! Wear or carry something unique. I know this sounds kind of weird, but I did this subconsciously…with a panda iPhone cover, hah! People stopped to tell me how cute my cover was WHILE I was on the phone or when I’m holding it. Wearing or carrying something unique always helps me start conversations with people. Now, that I have the plus, this rose gold case REALLY breaks the ice. Next, I’m going to have to find a way to own these rose gold APLs because I know I’ll be making a ton of new friends with these babies for sure! Talk about the other person. If you’ve ever spoken to a celebrity or an important person, they tend to ask you questions. Here’s why: real leaders make it about you, not them. When conversing with a leader in any industry, take notice how they’ll ask questions about you and your interests. Next, notice that when they speak to you, it’s as if you’re the only person in the room with them. That’s how some big leaders remember your name and what you’ve said. That, my friends, is real leadership. I’ve done this quite a few times myself because it takes the spotlight off of me and puts it on the other person. Then when the other person asks me a question, I’ll answer it quickly and put the spotlight back on them. Next time, when you’re nervous talking to someone, make the conversation about them. As you learn how to interact with people more and more, your self-confidence will keep growing. Take a leadership position in a small group/organization. This one is a major step for a lot of introverted/shy people. For me, it wasn’t until I took dance classes that my self-confidence started to grow over time. I mean, if you dance in front of people, it would have to grow, right? If you’re not up to taking classes where you have to get in front of a large group of people, try taking a leadership position in a small group/organization. However, make sure it’s a group in which you have a lot of knowledge about. If you know a lot about business, try doing a meet up. If you know a lot about fitness, try teaching a pop-up class. I first realized I loved public speaking when I was about to do a workshop on cigarette litter. Considering I had a background in environmental science and had volunteered with all of the Keep America Beautiful affiliates, I was very confident when I led the workshop. The more knowledge you have about something when you lead a group/organization, the more confidence you’ll have! This is not what it sounds. What I mean by this is to do a self-audit of what makes you feel good about your appearance. What makes you feel great about yourself and boosts your confidence? Does a manicure make you feel like a new person? 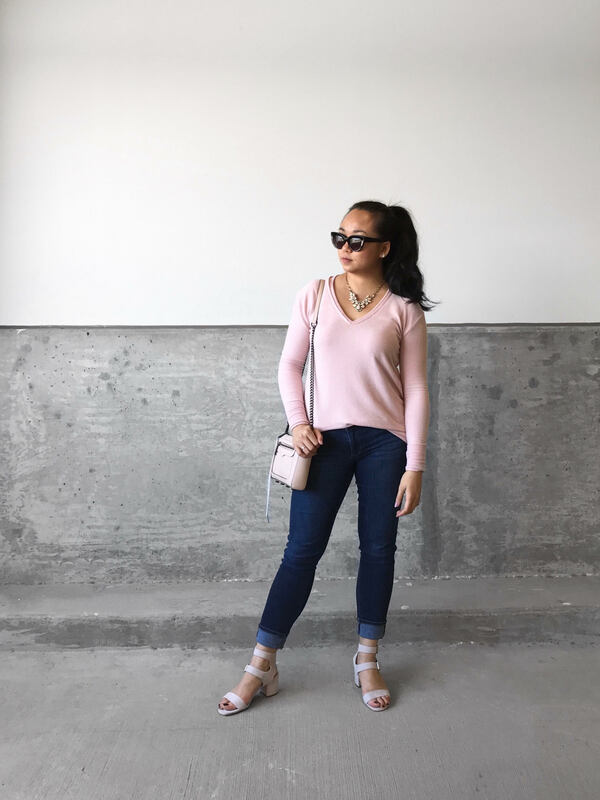 Do new shoes make you walk with more confidence? Does a swipe of your favorite lipstick make you feel like you can take on anything? Whatever it is, do more of it. For me, I feel most confident two ways: 1) an outfit that makes me feel powerful, so my “focus on my appearance” would be my wardrobe and 2) that feeling after getting a haircut. Y’all know what I’m talking about! I believe we will always be working on our self-confidence when we reach different stages of our lives. I’m still working on my self-confidence too (which is why I hate going to events alone), but my advice is based on my personal experiences and what has worked for me. I hope these tips have helped you in some way today! How about you? On another note, I’m SO ready for fall weather to arrive! 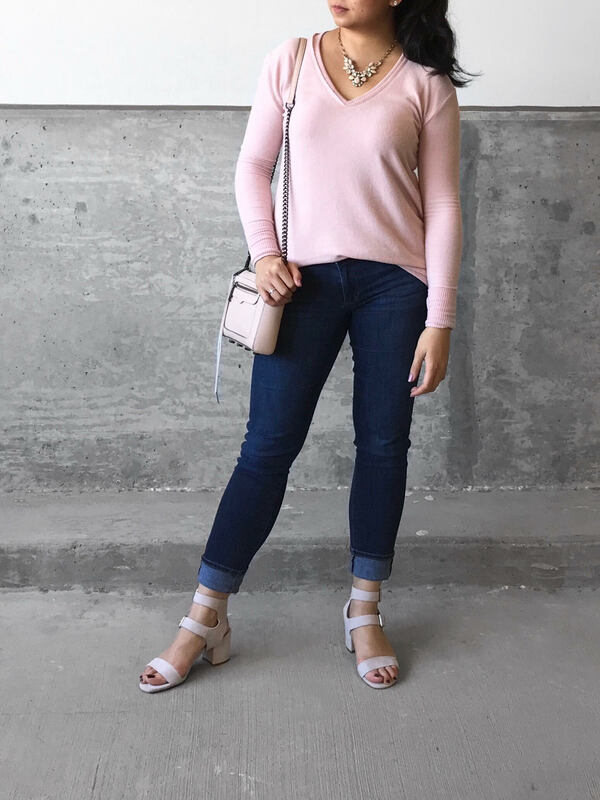 If you’re looking to add some tops to your rotation this fall, this blush sweater is SO soft. It comes in black, a light grey and olive green too. 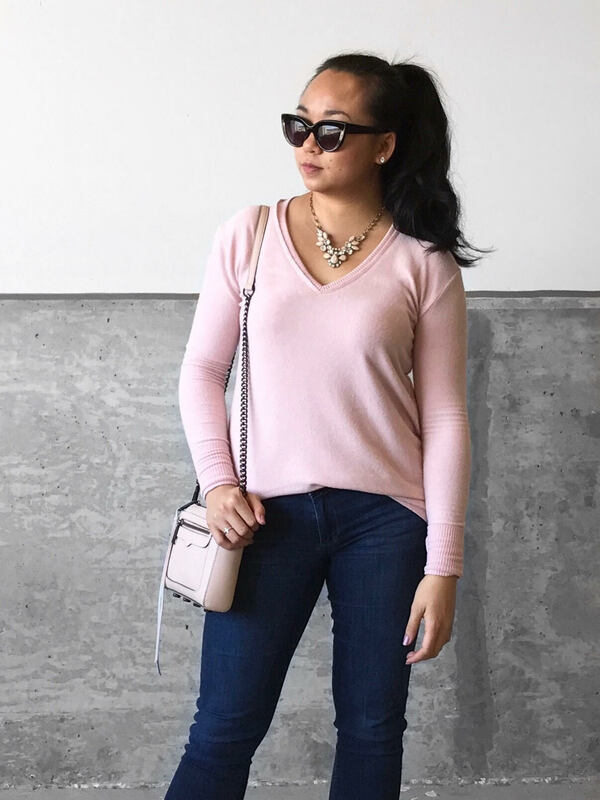 You can lounge in it around the house or add a statement necklace like I did to dress up a casual outfit a bit more. The material is stretchy, but if you have larger guns, it might feel a bit snug. Anyway, this is going to be a VERY busy week for me with two small group meetings with my church friends, bestie coming back home (yay!) and my brother’s birthday this weekend, but I love being busy! PreviousCoffee Date No. 9: Hellooo Fall!!! 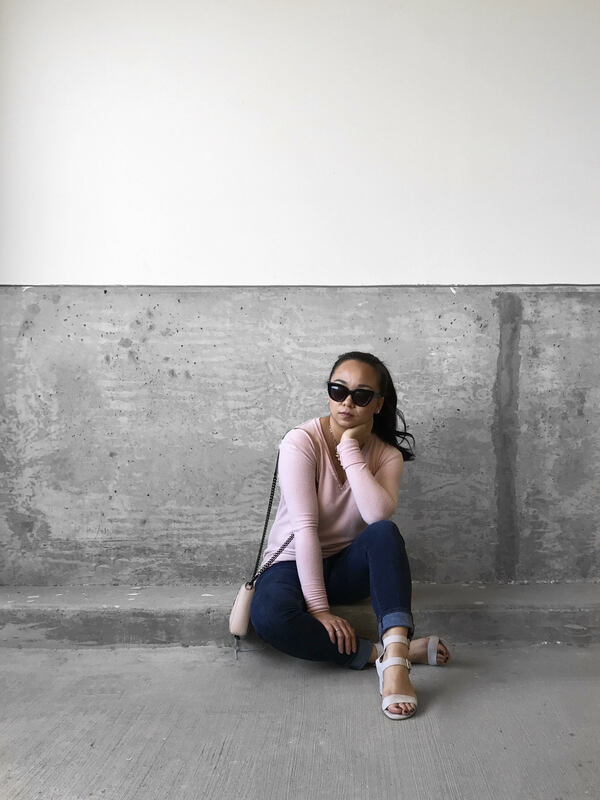 2 Replies to "Building Self-Confidence :: Blush Sweater & Skinny Jeans"